Steve Avery has been training since he was 15 years old. Since then he’s blasted his way to being the junior physique champion in England and was the current Junior Mr. United Kingdom when this video was shot. 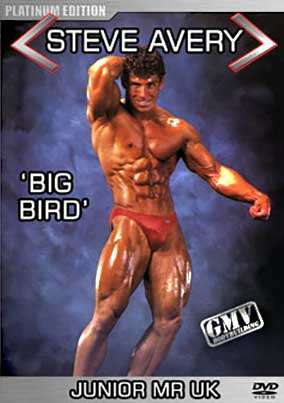 He was a winner at the 1997 Mr. Titan Contest in London, as well as winning the 1988 Junior Body Power Classic. Steve Avery has trained since he was 15 ½ years old. Since then he’s blasted his way to being the junior physique champion in England and was the current Junior Mr. United Kingdom when we shot this video. He won the 1997 Mr. Titan Contest in London, as well as winning the 1988 Junior Body Power Classic. Steve was also a top model, and cover man on ‘Muscle Photo’ magazine, see this DVD’s cover. At the age of 19 years, he has the bodybuilding world at his feet. This DVD will give you a comprehensive perspective on “Big Bird”Avery, the future star! Shot in our London studio, Steve pumps, oils and poses in tank tops, shorts and posing trunks. We see Steve in close-up as he pumps his arms and shoulders with dumbbells before posing them, rock hard and vascular, seen from every angle. Steve lays bare his feelings on drugs, officials, judging and politics in bodybuilding. He also gives his workout blueprint for other young bodybuilders to follow, giving advice on sets, reps and diet. See Steve’s brilliant posing routines where he demonstrates he is a master poser, with a ‘finished’ mature physique for a teenager.